It's probably an understatement to say that the 70s were a wacky time. This violent and turbulent decade was punctuated by the Vietnam War, an event which lead to a great deal of distrust and hopelessness in people. As if the world didn't seem unsafe enough, Jaws came along in 1975 and made it appear that nature was out to get us as well. Sure, there had been scary animal movies in the past, most notably Hitchcock's The Birds, but Jaws really struck a chord with the public and it inspired a slew of "nature amok" movies. 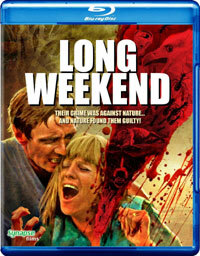 Australian Director Colin Eggleston and Screenwriter Everett De Roche took this idea and ran with it with their film Long Weekend, an eco-thriller whose themes were ahead of their time. Married couple Peter (John Hargreaves) and Marcia (Briony Behets) are going on a vacation, along with their dog, Cricket. We can already sense some tension between them before we learn that their plans don't gel. She had wanted to go to a resort, while he has decided that they should go camping at a remote beach. They drive through the night, where Peter runs over an animal, and find themselves lost. Marcia awakens the next morning to find that they were practically at the beach. While it is admittedly beautiful, it's also desolate. Marcia tries to make the best of things, while Peter goes swimming and absent-mindedly attempts to chop down a tree. But, the tension between them wells up again and the arguing begins anew. To make matters worse, their disregard for the safety and cleanliness of the camp has upset the animals and forest around them, and the couple soon find themselves being threatened by nature. Long Weekend is yet another one of those older movies which I've read about for years, but I hadn't seen until now. Nor have I seen the 2008 remake which stars Jim Caviezel. The synopses of the film which I'd read were always frustratingly vague. Having now seen the film, I know why, as the movie is difficult to describe. But, I can see how what little description that there is would look good on paper. A couple from the city go into the woods near a beach. Along the way they kill an animal, and once they arrive, they kill some more. They litter their campsite and destroy foliage. Therefore, nature will rise up and take its revenge. Or the movie could be read that the animals and flora in the area are simply reacting to the negative energy which Peter and Marcia are emitting. Or, once we learn what initially drove a wedge between the two of them, one's reading of the film could change dramatically and interpret the events near the beach as a totally different kind of retribution. Missed opportunities aside, Long Weekend does have some positive aspects. Again, the ecologically friendly theme of the film feels light years ahead of its time. Yes, there were plenty of conservation campaigns in the 70s, but the idea that nature will kill you seems pretty fresh. The couple are stalked by one of the animals they have injured in some scenes which don't quite work, but do present some creepy ideas. As stated above, the movie has a palpable sense of dread, and the third act gives off the sense that this isn't going to end well for anyone. I was very impressed by Eggleston's use of moving camera, which does help to give the film a more modern feel. Seen today, some of Long Weekend may seem ludicrous, but if one is in the right mindset and can avoid laughing (and not dwell too much on that mysterious van on the beach), they you will find a movie which once again reinforces why I don't go camping. Long Weekend wouldn't tell me if that crab was a robot on Blu-ray Disc courtesy of Synapse Films. The film has been letterboxed at 2.35:1 and the Disc contains an AVC 1080p HD transfer which runs at an average of 30 Mbps. The transfer is sharp and clear for the most part. Some shots do show obvious grain, but for the most part, the image is clear. There are some very mild defects from the source materials, but these are kept to a minimum. The colors look good, and the image is rarely washed out. The picture is never overly dark or bright. The level of detail is good, but some shots look a bit flat. The Disc carries a DTS-HD Master Audio 5.1 track which runs at 48 kHz and an average of 3.6 Mbps. The track provides clear dialogue and sound effects. For an older, remixed track, we get some impressive surround sound effects here, most notably animals sounds which come from the woods. The ocean sounds emanate from the stereo speakers, giving a nice sense of space. I didn't detect any notable subwoofer effects. The Long Weekend Blu-ray Disc contains only a few extras. We begin with an AUDIO COMMENTARY from Producer Richard Brennan and Cinematographer Vincent Monton. There is a STILL GALLERY, during which we hear an interview with actor John Hargreaves. The final extra is a THEATRICAL TRAILER for the film.